By	Allyson Haymaker. Last edited by Marios Alexandrou on June 4, 2018. While traveling in western Nebraska, my husband and I heard about an unusual lighthouse at the Lake Minitare State Recreation Area. 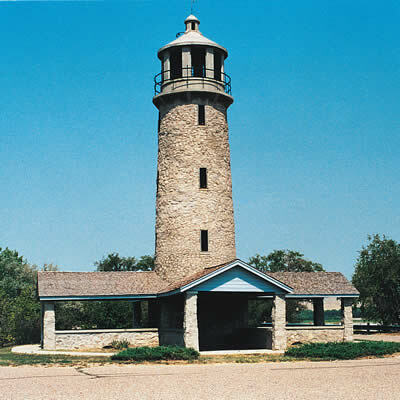 The 55-foot-tall structure is the only inland lighthouse in Nebraska, and one of only seven nationwide. Civilian Conservation Corps workers built the shelter/observation tower out of native stone between 1937 and 1939. A climb to the top rewarded us with a great view of the lake and surrounding river valley. This pretty little oasis is open from January 15 through October 15. Its entrance is on Stonegate Road, about 9 miles north of the town of Minitare, which is on U.S. Highway 26, roughly 10 miles southeast of Scottsbluff. The park includes 110 undeveloped campsites and 52 with electrical hookups only. Day-use admission is $3 per vehicle; campsite rates range from $4 to $13 a night. For further information, call 1-308-783-2911. I would just like to say that, that particular lighthouse is awesome! I grew up in the Scotts Bluff area and then moved away to travel for many years... Any way now that I am back home to be with my family, I only wish that there could be more information about Lake Minitare linked to this website. This is the first sight that I came across while using google. I love to fish, swim, camp and everything that goes along with it.